This wiki page is currently under construction! Since this article is not complete, expect it to cut off abruptly or not contain all of the information you expected. You can help by adding information, formatting or otherwise just helping to complete it. A crash course in Space Station 13's history. It's no doubt you've heard that SS13 actually started out as an air simulator. Unlike a lot of other things people say about the history of SS13, this is actually quite true. Strange as it may sound, SS13 was created by Exadv1 as a simple hobby project/air physics demo. While Exadv1 cites the sci-fi genre in general and the Alien franchise in particular as a huge influence on the game, the two works that directly inspired him to make it in the first place directly involved atmospheric simulation. One was an article in Game Programming Gems 3 that outlined a basic framework for using cellular automata to simulate air physics. The other was a BYOND game called Space Tug, an Alien homage featuring exaggerated hull breach physics. Together, both of these works inspired Exadv1 to implement his own vision of atmospheric simulation. In fact, some of the game's central mechanics were added simply to make the air simulation more interesting. For example, plasma, the miracle substance at the core of SS13's lore, was added because Exadv1 wanted a gas that was visible in air and thus more pleasing to work with. Even the setting serves second fiddle to the atmospherics. Initially, the game was set on the surface of an Earth-like planet, but was moved to outer space as an excuse to include vacuum physics. After a few months of coding, including a week for the basic atmospherics frame, SS13 was released in BYOND on February 16, 2003. The Old Storyline, in all its flowchart glory, was posted some months later. It was not a very popular game. A few servers were available, but player numbers rarely reached double digits. The community itself consisted of less than twenty people, with 5 of them, including Exadv1 himself, holding admin powers. Unlike today, most of them knew each other from other, far more popular BYOND games and often had each other on their friends list. Much like today, most people spent their rounds bashing each other's heads in with toolboxes and air tanks. While there were jobs like Medical Doctor, Station Engineer, and Toxins Researcher, job-related content was quite sparse, so many were bored with nothing better to do besides beat each other up. Unlike today, hardly anybody minded. Most people saw it as friendly horseplay or forgive/forgot about it later. That's not to say there wasn't any drama. There was some bit of tension between players who preferred roleplay and those who preferred action, and, when host files were distributed later on, there were a few admins and server owners known to abuse their powers. That said, it was of a much smaller scope than today. And that was all they did. Initially, there were no game modes at all; the "round" ended whenever someone decided to take down the server. However, shortly after the release, Exadv1 did add a handful of game modes. Traitor: One crew member was actually a Syndicate agent tasked with assassinating someone, usually the Captain. The crew could discover the identity of the traitor by using, of all things, Research. Later on, traitors gained uplinks and access to a handful of weapons and tools. Meteor: Poorly-drawn meteors would occasionally collide into some random part of the station, tearing up any walls, windows, machinery, and people (though not any floors) in the way. Had a rather poor reputation as being unfun. Extended: No antagonists or hazards would spawn, so the station crew were free to build things and beat the crap out of each other without any space rocks or assassins to interrupt them. So-called because the shuttle arrived later than usual, i.e. the round length was "extended" for a while longer. Monkey/Infection/Monkey Infection: One player was a monkey with a disease that turned other people into monkeys. Reception was rather mixed. Nuke: A crew of Syndicate operatives attempted to destroy the station with a nuclear bomb. Unlike in modern Goonstation, the nuke required inserting the auth disk, activating lots of weird random toggles, and inputting a special code. Over time, Exadv1 gradually drifted away from SS13 to focus on school and other projects. In the years since, the SS13 community stayed active but stagnant. The team Exadv1 appointed continued to develop his code and maintain the SS13 forums and website. One of the team members, a programmer going by AZA, attempted to remake SS13 four times, with little progress. Meanwhile, a user named Hobnob was hard at work reverse-engineering SS13, decompiling host files and splicing binaries, eventually managing to create his own mapping tool. Remember these names. Suddenly, in March 2008, the source code for SS13 was unexpectedly released. The exact details are still rather hazy, and there are many rumors on how and why the source got released. Immediately after the release, many suspected that a disgruntled programmer leaked the code, supposedly against Exadv1's will. Several stories claim the code was actually stolen, with many versions saying one of Exadv1's own friends pilfered a flash drive with the source during a house visit, in some versions accidentally, some intentionally. Other speculate that Exadv1 gave the host files to somebody (typically AZA, one of the programmers), who, after some disagreements, (the particular issues vary) gave to another user, Hobnob. Hobnob then decompiled the code himself and gave it to AZA, who then released it. Exadv1 himself did not witness the leak, as he had left SS13 long ago to focus on schoolwork. He has no recollection of any flash drives being stolen, and, besides, he kept the source on a hard drive, not a flash drive. In fact, in his 2017 interview, listed below, Exadv1 insisted there was no theft of any sort at all. Rather, he willingly handed over a copy of the source to AZA and gave him the rights to do essentially whatever he wished do with it, including, implicitly, release it. One of the old SS13.net blog posts somewhat confirms that AZA had this sort of privilege, making this one of the more plausible versions of the story, but, unfortunately, the Downloads page reminds lost to the ages. Eventually, Hobnob and a few other users created the first open-source version of SS13 called, in the typical OSS creativity, OpenSS13. Thanks to the open source, Space Station 13 gradually improved in quality and gained popularity within gaming communities. Around the same time of OpenSS13's inception, goons from Something Awful began to take interest in the game and goon-hosted servers appeared. While other communities used the OpenSS13 code, Goonstation coders worked on their own closed-source code. Eventually, in 2009, Goonstation successfully produced a new and unique station, known as Donut Station. This was a major accomplishment for the game. 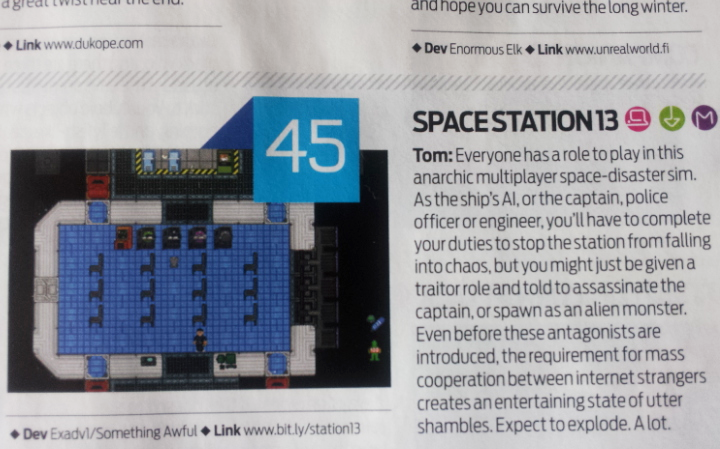 As the popularity of Space Station 13 rose even further, a second map was required to fit the higher number of players. Thus, in early 2010, Devstation was released. A large portion of the game's original code was rewritten and improved. On April 2010, goonstation released their current revision of the code, known as r4407. The release of r4407 allowed many communities to produce their own servers. For example, /tg/station came from 4chan's /tg/ community. Goonstation continued working on their own code, while other servers made their own changes to r4407. Each branch of SS13 had their own set of coders, and their own version of Space Station 13 code. New stations were produced and player numbers continued to rise. The game even started to receive recognition in gaming magazines. On March 2nd 2016 most of Goonstation's code got leaked by someone named 0xCSRF. He obtained it by finding an admin's password in a hacked password dump from xsplit and found the Goonstation repository on bitbucket. A player named ErikHanson paid him 400$ in bitcoins to not leak it or to get him an exclusive copy, but that did not work at all. It was leaked and put on Github. The admins published a public response and put the proper current source on github, labeled Goonstation 2016. This release has inspired the goonstation community to contribute to the branch, prompting the admins to open up a patches subforum on the official forums. This page was last modified on 20 April 2019, at 23:21.